I thought I had everything figured out. My first year or two out of college, anyways. For the past four years, I had worked hard both in and out of school. 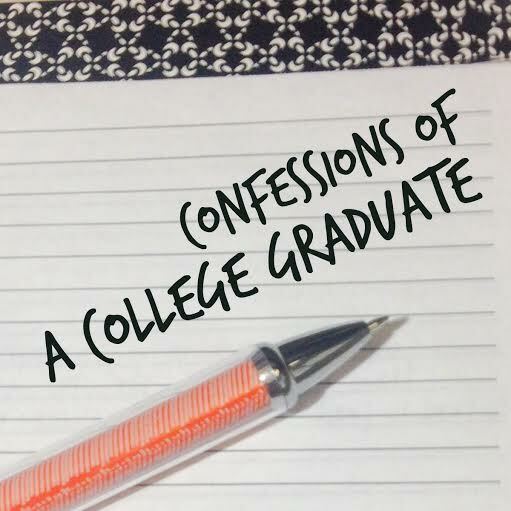 With my experience and accomplishments, I was sure I'd have no problem landing a job straight out of college. I'd focus solely on my career while saving up my money and enjoying the adult life with my best friend aka boyfriend. Wow, was I wrong! Six months after graduation, I type this blog post both jobless and single. I never saw this coming. I knew things would change after graduation, but not to this extent. Just about everything I knew for the past 4+ years had come to an end in a matter of a week. I went from an overly booked schedule to an empty book. Job searching is almost a job in itself; constantly researching, emailing, calling, writing cover letters, updating resumes, interviews, and coffee meet-ups. Sometimes, It's difficult to stay positive when continuously receiving negative news. At times, I've lost sight of my passion. Now, for the relationship bit...My heart is racing just typing this. I shouldn't let this effect me as much as it has, but when you've been with someone for 5 years, it becomes a struggle. I'm lost, confused, and alone on the situation. I hate to be a negative Nancy, but it's been a rough time for me. Especially since I tend to hold in a lot of my feelings. My problems are my problems. Why burden others with them? I questioned posting this. However, a few fellow bloggers inspired me to open up. I know I'm not the only person struggling out there with similar issues. We will have our moments. We're human. However, we must try our best to rise above. This is our time to establish who we are as young professionals and individuals. It's time to take advantage of our "freedom" and possibly explore the world. Truly uncover our dreams. Find inspiration from new things and incorporate them into our personal and professional work. Keep busy and volunteer your time. Start a journal. Ignite old passions. Confide in a friend, for keeping to ourselves will tear us down. Focus on the positives in your life and when the time is right, let out a good cry. We will get through this and we will get to where we want to be when the time is right. --including me! We are in this industry together. It's not a man's world. It's not a woman's world. It's OUR world.